Designed to help you improve your meditation. The aim of the one day retreats is to provide those attending with the opportunity and knowledge to be able to take that next step in their spiritual evolution towards self mastery. The hope is that through attending this programme, all will feel increased desire to meditate regularly at home and go deeper in their connection (yoga). 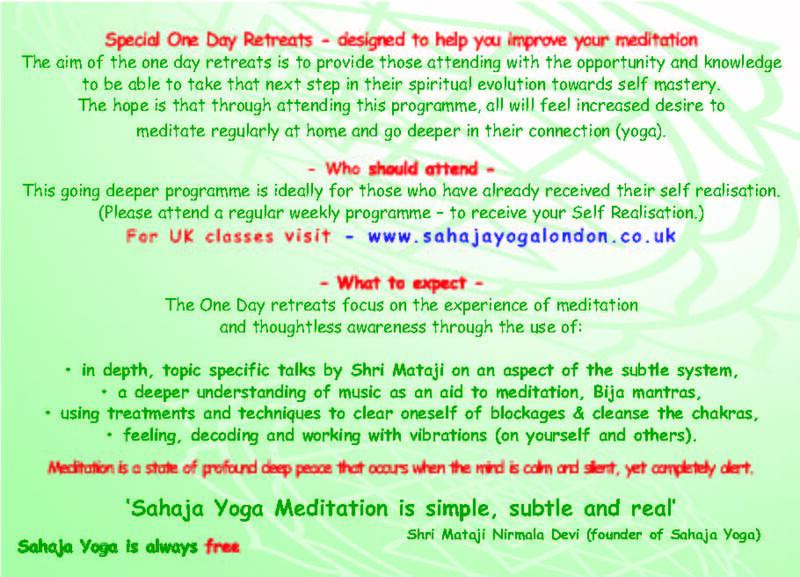 This One Day Sahaja Yoga Meditation Retreat is ideally for those who have already received their self realisation at a free weekly meeting, show or music event or expo. Therefore, to get the most out of the day please attend a regular weekly programme – to receive your Self Realisation. • feeling, decoding and working with vibrations (on yourself and others). Meditation is a state of profound deep peace that occurs when the mind is calm and silent, yet completely alert.